During the Eelam War (1983 -2009) a significant numbers of the Sri Lankan military forces had committed suicide and some of the victims believed to have suffered from combat related stress. Psychological autopsies of some of the cases revealed that the victims had depression, posttraumatic stress, psychiatric illnesses, addiction issues, relationship problems and severe work related stresses. Most of these suicides could have been avoided with early interventions. From 1987 to 2009 the Sri Lankan Military had launched nearly 25 major military offensives against the LTTE. In these military missions the members of the armed forces underwent severe battle stresses that affected them physically and psychologically. Some combatants witnessed the deaths of their buddies as a result of sniper fire, mortar and artillery attacks. Many witnessed the gruesome realities of the war. Following the overwhelming combat stress many had nostalgic and pessimistic feelings about life. Some soldiers could not cope with the devastating events related to the war and took their own lives on the battlefield. These actions were condemned by the military law and criticized as acts of cowardice. Downheartedly most of these victims did not receive military honor posthumously or pensions for their dependents. But the fact remains that a notable percentage of combatants committed suicide were psychological casualties of the war probably shattered by the combat stress or battle fatigue. Therefore proper investigations would be needed to extract the truth behind these military suicides and cases should be reviewed through a compassionate eye. Some military suicides had been recorded during the active combat. Following abstract from an eyewitness’s account during theElephantPassdebacle that occurred in 2000 due to the inefficient strategic evacuation plan. During the EPS debacle, 359 military personnel were killed, 349 were listed as Missing in Action and some 2500 were injured. Corporal KXX29 described the events that took place between the 21st of April 2000 and 22nd of April 2000. ……. The enemy was advancing and we were retreating towards Palei. I saw a number of soldiers fell down on the way due to exhaustion and to the heat wave. We could not help anyone and we had to move forward. The enemy was attacking us with mortar and sniper fire. Our soldiers were scatted all over. In the meantime the enemy followed us. We attacked them with our light weapons. Soon our ammunition was over. Our only option was to go to Palei and join the battalion strong hold there. My buddy was exhausted, he asked me to leave him and walk away. I left him near a bush. He had a grenade in his hand. He told me that when the enemy comes near him he would explore the grenade. I had no option, the enemy was coming nearby. I had to abandon my buddy and go. While I went further I heard a grenade explosion. I was upset but the physical exhaustion and dehydration had blocked my sorrowful thoughts. When I went to Palei I merely lost my consciousness. I was admitted to the hospital. Upon my discharge I looked for my buddy but he was not among the survivors. Later he was pronounced as MIA. Research and investigations revealed that the combat related PTSD was emerging in the Sri Lanka Army (Fernando & Jayatunge 2010). Numerous researches indicate that there is a correlation between combat trauma and suicidal behaviors (Knox, 2008). Studies suggest that suicide risk is higher in persons with PTSD (Ferrada, Asberg, ., Ormstad, & Lundin 1998). Many researchers believe that disturbing symptoms of PTSD increase the suicide risk and others of the view that comorbid psychiatric symptoms that are associated with PTSD drive the victims to commit suicide. Many Sri Lankan combatants suffered from PTSD or gross battle fatigue often tried to hide the fear feelings that were associated with combat stress. The avoidance of combat events and places or manifestation of fear feelings were considered as an act of cowardice. There were a number of disgraceful names that had been used to call the battle fatigued soldiers. The words like Lossa (loser) Chokalat Soldaduva (Chocolate Soldiers) had been widely used. Therefore the suffers often took extreme effort to hide their battle fatigue symptoms. In the early stages of the war military doctors paid their attention to the physical wounds rather than the mental wounds. Generally those who had flashbacks, nightmares and avoidance were blacklisted as cowards, malingerers or drug (cannabis) uses. Therefore many soldiers repressed their horrendous memories about the war and served in the battle field facing the enemy. Some went in to dissociation (psychogenic epilepsy, psychogenic tremors, and fugue states) and having medically unexplainable symptoms such as pain related somatic symptoms. It has been reported that overwhelmed soldiers had acute stress reactions in the war fronts. Combatants with posttraumatic stress and comorbid depression who had no escape route often took their lives on the battlefield. Lt BXX26 witnessed the death of seven soldiers in Paranthan (in Northern Sri Lanka) following mortar attacks. Although he was physically unharmed he witnessed how the incoming mortar killed seven of his men immediately. Their bodies were blown in to pieces and this horrible event caused an acute stress reaction in him. Later he was evacuated to Colombo. After the Paranthan incident Lt BXX26 experienced intrusions, flashbacks, nightmares and avoidance. He was diagnosed as having PTSD. Lt BXX26 felt that he was personally responsible for the deaths of seven soldiers in Paranthan and had severe survival guilt. Following overwhelmed negative feelings several times he tried to commit suicide. His treatment took years and finally the doctors were able to diminish the survival guilt and suicidal ideation. L/ Cpl WXX43 became a psychological casualty of the war after handling human remains at Mulative. For many years he felt depressed and troubled by nightmares. L/ Cpl WXX43 could not forget the decomposed and swollen bodies that he buried at Mutative. Some of the victims were known to him. He felt utterly despaired after this horrific experience and after sometime diagnosed with PTSD. He was consuming large amounts of alcohol to evade startling reactions and nightmares. In 2003 he decided to take his own life and took poison. His life was saved by immediate hospitalization. Private MXX33 underwent traumatic battle events in the North and as a result of war trauma he suffered full blown symptoms of PTSD. His condition was undetected and untreated for a number of years. After he became a psychological casualty of the war his behavior changed drastically. He became hostile and several times he was charged with disciplinary infractions. He could not serve in the operational areas following avoidance (which is a marked clinical feature in PTSD). He felt uncomfortable to travel in military vehicles (which trigged after seeing a land mine explosion in Mannar) and to carry fire arms. But the military duties demanded him to serve in the operational areas with fire arms. He could not get a help from his unit and finally decided to become AWOL. He found a job in a private company as a driver. While he was employed in the company his PTSD symptoms troubled him once again. He had nightmares, intrusions and flashbacks. His memory was fading and he could not concentrate. His hostile behavior led his wife and children to leave him. Following stress, isolation and depression he tried to commit suicide by hanging. His neighbors immediately intervened and hospitalized him. At the hospital he revealed that every night in his dreams he used to see the horrible events of the war. When he was experiencing flashbacks he could hear gun fire and the helicopter sounds. He could not tolerate noises and his emotions had become numbed. After structured clinical interviews Private MXX33 was diagnosed with PTSD and sent for appropriate treatment. He rejoined the Army and today serves as a productive member. He is now free of suicidal thoughts. Depression is a mood disorder in which pathological moods and related vegetative and psychomotor disturbance dominate the clinical picture. The Post combat depression is described as a group of symptoms such as anhedonia (feeling of sadness and loss of ability to experience pleasure) low energy, decreased libido, reduced life interests, somatic pain, alienation, numbing, self-blame and survival guilt that is experienced by combat solders after exposing to traumatic battle events. Depression causes a disturbance in a soldier’s feelings and emotions. They may experience such extreme emotional pain that they consider or attempt suicide. Soldiers could suffer from depression as a result of survival guilt, collateral damage to the civilians and constantly living in a socially deprived environment. Many soldiers become desolated about their lives and tend to have nostalgic feelings. They gradually shift away from the rational reasoning and find death as an answer to their agonizing problems. Social isolation, moving away from their buddies and lack of unit help and cohesion aggravate the situation leading the soldier to commit suicide. Private KXX32 took an immense effort to save his buddy who sustained a gunshot injury to the stomach during the Operation Jayasikuru. 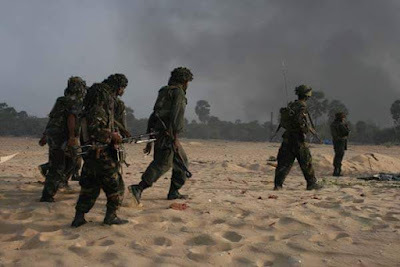 (The Operation Jayasikuru or the Victory Assured military campaign was launched in 1997 to regain the LTTE-held Wanni and Mullaitivu areas and subsequently to open a land route through Wanni and Kilinochchi districts to link up with the Jaffna Peninsula). He carried his wounded friend for more than a kilometer to the nearest medical point. On the way his buddy passed away. This event caused devastating results. Private KXX32 felt that he was personally responsible for the death of his friend and went in to severe depression. But he did not seek any medical or psychological help. Survival guilt troubled him so enormously and on one occasion he made an unsuccessful secret attempt to remove the pin of a grenade. In the later years he was contemplating to commit suicide. When he participated in operations he took unnecessary risks anticipating enemy fire. Several times he walked to the enemy lines and deliberately exposed himself in to dangerous and suspected enemy sniper points. Meanwhile his clinical depression progressed with severe headaches and that forced him to seek medical attention. During the medical assessment his depressive elements were elicited and then treated accordingly. His illogical and irrational thoughts were challenged in friendly mediation and finally Private KXX32 realized that he was not responsible for his buddy’s death. Lt JXXY54 served 19 years in the Army and most of his time was spent in the operational areas. After participating in many military operations he became physically and mentally tired. He had low energy, pessimistic view of the military life, feelings of worthlessness and guilt, impaired concentration, insomnia, diminished interest in pleasurable activities and recurring thoughts of death. He had been planning to commit suicide. In his own words Lt JXXY54 described his wistful feelings thus. I have been serving in a fighting unit of the Sri Lanka Army since 1982 and participated in numerous battles. I joined as a private and then was able to get promotions due to the bravery that I had demonstrated on the battle. I was decorated several times. Over the years I saw deaths and annihilation. Most of my unit members are dead and only a few are remaining. I think I am tired and exhausted. I don’t see glory in war anymore. Everything ends in death. I have a great compassion for my friends who perished in front of my eyes in Welioya, Palampiddi, Kanagarayankulam , Mankulam and other places. I know they would never come back and their families would never have peace. I wish I was dead with them. My world has fallen apart and I feel that I am lost and I am unable to feel happiness anymore. I don’t see a specific reason that I should keep on living”. In 2002 Lt JXXY54 was diagnosed with Major Depressive Disorder and treated with medication and psychotherapy. Bunker suicides were common during the Eelam War. The bunkers were used to protect the military camps and often situated inner and outer perimeter of a camp. These bunkers were made of Palm or coconut logs and covered with sheets. The living conditions were extremely hash in the bunkers. It had minimum comforts. The day time inside the bunker was awfully hot and when it rained the water stagnated inside the bunkers. Two or three soldiers did bunker duties and often they had to be vigilant for long hours. They did not receive adequate rest or sleep. Chronic sleep deprivation was very much common among the soldiers who did bunker duties. They had to serve months and months without leave and many soldiers became exhausted. Boredom, monotony, isolation and uncertainty, distressing feeling of unexpected enemy attacks hugely affected the combatants and their mental health. Following overwhelming stress some soldiers shot themselves while on bunker duties. Frequently the combatants used their firearm to commit suicide. In some extreme cases explosives (grenades) had been used. According to the unit members most of the victims had suicidal warning signs prior to their deaths. Some had openly talked about their deaths and displayed a number of suicidal warning signs. Private CXX27 served in Muhamale area in Jaffna before committing suicide in 2005 during the ceasefire agreement. He had served in the military for over five years and participated in the Operation Agnikeela in 2001. According to his friends he was troubled by personal issues and became more and more isolated. Once when his buddy went to have his lunch Private CXX27 was alone in the bunker. While the other members were having lunch they heard a gunshot from Private CXX27 bunker. When they went inside his bunker they saw Private CXX27 had shot his head with his personal weapon. Bulling and hazing had been reported from the Northern war front. Hazing was one of the issues that led some soldiers to commit suicide. It has been noticed that lack of monitoring by the officers and fruitless platoon leadership had led to critical situations. In many armies around the world hazing has become a common but extremely damaging factor. Some senior NCO s use hazing to implement discipline and surge the physical and mental endurance. Physical punishments, vigorous exercise were frequently used to discipline the soldiers. Beatings were not uncommon. But often hazing had caused disastrous outcomes. Sometimes Sexual harassments had occurred in the battle fields and victims had no escape route. Many of these unfortunate events ended up in desertion, self-harm or sometimes suicides. Private WXVX shot his stomach following hazing by two corporals in 2005. The bullet pierced through his bowels but likely the vital organs were not damaged. The Renowned Military Surgeon Dr. S.S Jayarathne performed urgent laparotomy and saved the soldier’s life. After his recovery Private WXVX was diagnosed with Adjustment Disorder. The investigations revealed that the senior Corporals had used inhuman methods to harass Private WXVX. The ongoing war condition in the Northern Sri Lanka had created severe demands and tension among the soldiers and officers. Although the resources and manpower were limited the Sri Lankan military did their best to defend the enemy attacks. The enemy attacked in unexpected moments and these attacks caused human lives and destruction of property. There were no adequate numbers of soldiers to hold the ground especially during the Operation Jayasikuru in 1997. It became one of the major problems in the Army. The soldiers had to fulfill numerous duties. Lack of men power caused heavy burden on solders. Severe work related stresses were mounting among the officers and soldiers who faced a gruesome enemy. The soldiers who served 30 – 45 days in the war zone had 10 days of leave. When the military operations surged this leave system changed and many soldiers had to serve a number of months without any recuperation or leave. The soldiers had no regular leave and sometimes their leave got cancelled unexpectedly. The soldiers could not attain their family commitments and it led to deep frustration and disappointments. Commonly the soldiers felt angry and disenchanted when their leave were cancelled. The burnouts were in abundance. Some work related stresses ended up in fatal outcomes. A large number of the members of the military forces who served during the war were young people. The nature of their work and duty prevented them frequently meeting with their loved ones accumulating severe relationship issues. Some surveys indicate that lack of trust, self-esteem issues and jealousy had caused many relationship problems. In addition Conflict and stress aggravated relationship problems caused risk of suicide among the soldiers. It has been reported that some young soldiers had committed suicide following failed love affairs. Private CXX24 became extremely devastated when his girlfriend left him. He frantically tried to call her but did not get a reply. Then he applied for leave to get two day vacation to meet his girlfriend. Regrettably his leave was not approved by his commanding officer. Private CXX24 made one last try to call his girlfriend and then went to the wash room and hanged himself with his shoelace. One of the soldiers who became suspicious of Private CXX24‘s movements informed the unit Sergeant. When they broke in they saw Private CXX24 was hanging. Soon they gave first aid and hospitalized him. He was treated for three weeks at the hospital and later diagnosed with Adjustment Disorder. After the medical management Private CXX24 was referred for counselling. A murder–suicide is an act in which an individual kills one or more other persons before or at the same time as killing himself or herself. Over the past thirty years several murder -suicides had been reported from the combat zones in Sri Lanka. Mostly these unfortunate incidents were triggered by work related disputes and in severe harassments. In 2012 a soldier on duty in the North turned the gun on his colleague following a personal argument before killing himself. During the War combatants used numerous methods to end their lives. Frequently they used their fire arms to shoot themselves. Mostly head neck, chest, abdomen or under the chin were the selected anatomical sites where the combatants frequently decided to put the bullet through. In many cases soldiers shot themselves in front of their buddies or sometimes in isolated places. Some left suicide notes before taking their lives. These letters reflected the depression and anxiety they were experiencing. Often these letters were addressed to their mothers or girlfriends. Hanging and taking poison were not uncommon. There were numerous occurrences where soldiers took medication overdose to commit suicide. The victims often took Paracetamol or prescribed psychiatric medication (SSRI, Lithium, Sodium Valproate, Risperidone, Clozapine etc.) to overdose. We have found that some soldiers walked to the enemy lines (later they confessed) expecting a sniper fire. In another event we found a soldier planned a road traffic accident to masquerade the suicide. He sustained fractured femur and broken ribs after the attempt. There is an unbreakable link between suicidal intention and taking unnecessary risks on the battle field. Following is a narration by a Corporal who witnessed an attempted suicide in a bunker in Jaffna in 2003. Several days we observed that Lance Corporal GXX was not in his proper senses. I noticed extreme changes in him over the past few weeks. He had a problem with his girlfriend and he was planning to go home for his leave turn. But his leave was cancelled two days ago. He did not speak with us like early days. He wished to be alone and he was thinking of some problem that affected him relentlessly. He smoked heavily sometimes violating night rules. I noticed that when he was doing the bunker duties he was not paying attention. He was severely scolded by the unit Sergeant this morning. But Lance Corporal GXX did not show any emotions in front of the Sergeant. When the breakfast was brought as usual we ate ordering Private Priyantha to be on guard. Lance Corporal GXX did not eat much. He was thinking about something. Finally I asked what the hell is wrong with you. But he did not reply. Suddenly he got up and got hold his T56 then loaded the gun and put the muzzle of the gun under his chin and then tried to pull the trigger. Immediately I got up and grabbed the gun from him, then I slapped him. You are a coward I scolded him. Then Lance Corporal GXX started crying and said let me die. But we took him to the Sergeant and then to the Commanding Officer. Later he was taken to the Palali Military Hospital. Some combatants use suicide threats as a part of malingering and manipulative behavior in order to fulfill their petty egoistic needs. The malingerers often use conscious deception to avoid unpleasant duty, hazardous work, or active combat situations. But often these people have underlying issue especially work related stress or work related confrontations. Therefore rather than punishing the person under the military law its necessary to assess the condition and pending threats while providing answers to their imminent problems. The Historian Tony Judt illustrates the post-war period as the interval immediately following the ending of a war. Post-war period marks the cessation of conflict entirely. Sri Lanka has entered the phase of post war in 2009 after militarily defeating the LTTE. Although the war is over one should not forget that the aftermath of post combat stress factors. The combatants who fought a prolonged battle do not become normal citizens overnight. There are considerable numbers of soldiers with undiagnosed post combat reactions who could become psychologically vulnerable with ongoing life stresses. The late manifestations of combat stress reactions could emerge in the post war era. According to Dr. Michael Robertson of the Mayo Wesley clinic ex- servicemen can experience delayed reactions of combat stress. He had documented delayed combat trauma reactions in WW2 veterans. The post war experiences in Korean and Vietnam wars indicate that combat stress could emerge in the post war era in great proportions. The US veterans who fought in the Korean and Vietnam wars had delayed combat trauma reactions and many ended up in self-harm or suicides. Similarly the British veterans who participated in the Falklands War and the Soviets veterans who fought in the Afghan War experienced traumatic combat trauma reactions in the post war periods. Therefore the Sri Lankan combatants who underwent immense combat stresses during the 30 year Eelam War are having impending mental health risks. Some of these reactions are still asymptomatic and could surface with aggravating factors. The recent reports indicate that there were several military suicides after the war. In May 2012 a soldier attached to the 51st Division of the SLA shot his colleague and then took his life after an argument at a security check post near the Naga Viharaya in Jaffna. The post war era is often linked with economic and psycho social problems. The war destroys the social fabric and the ex-combatants and civilians experience the hardships of war wrecked society. Economic recession may significantly elevate suicide rates in many regions. For example, high suicide rates during economic recession in Japan were documented during the post-World War II period, 1975-1990 (Goto et al, 1994). Long-term exposure to war and postwar stresses could cause serious psychological consequences among the soldiers. Therefore the combatants of the Sri Lankan military who fought the Eelam War need widespread psychosocial support system and case identification by the experts to prevent aftermath of the war trauma. The research in Bosnia and Herzegovina indicated that postwar stressors did not influence the prevalence of PTSD but they did contribute to the intensity and number of posttraumatic symptoms. (Klaric et al., 2007). Military suicides denote the unproductive way of managing the soldiers during the war and in the post combat era. It is the duty of the military organization to prevent suicides and self-harm among the soldiers. Suicides do not occur in a vacuum and sometimes soldiers plan their suicides for months and in some instances for years. Many victims show suicide warning signs prior to their fatal acts. The unit members and the unit leaders should be trained and educated about the suicide warning signs. When a soldier with potential threat is identified, he should be handled carefully without punishing or any kind of harassments, and then refereed for medical / psychological management. Combat trauma can cause depression and anxiety related ailments and often the victims are overwhelmed by stress and could become psychologically vulnerable. As a result of these complications a combatant could think of suicide as the final solution. Therefore combat stress reactions should be detected effectively and extensive screening and potential case identification would be important to prevent suicides in the military. The military should create awareness on suicide issue and should have a healthy communication system among its members. When there is a crisis the affected member should feel free to seek help. Obtaining services of the experts in suicide prevention is highly important. Over the last three decades the Sri Lanka Army launched an elongated battle with the World’s Deadliest Terrorist Organization without recruiting Military Psychologists and for long years the Army had a few visiting Psychiatrists. These short sighted measures increased the psychological casualties in the military. Therefore to prevent further damage efficient military counselors, peer listeners should be trained to prevent suicides and selfharms. All Medical Officers, and Nurses attached to the Army should be trained to recognize the signs of mental illness, and trained in methods of suicide prevention. War trauma is not specific to ranks and it could affect soldiers as well as the officers. The stigmatization of mental health issues is a debilitating problem in treatment of traumatized war veterans. Sometimes stigma and discrimination prevent combatants to seek psychological help. Therefore de stigmatization and health education are key components in preventing suicides in the military. A special attention should be given to the combatants with the past history of hazardous combat exposure and if any signs of PTSD or Depression emerge they should be referred for medical treatments. The health staff should actively screen for potential victims and offer support with respect and empathy. The combatants helped to end a disastrous elongated armed conflict in this country. During the war many became psychological casualties and could not get adequate psychological helps. Following the aggravating mental health problems many could not cope and went in to negative stress coping methods such as alcohol abuse, social violence, domestic violence and self-harm. A considerable percentage went further and selected death as a way out to end their psychological anguish. These military suicides signify individual as well as a collective tragedy in the Sri Lankan society questioning our moral beliefs. In this context preventing suicides in the military are essential. We ought to take immediate actions to heal the members who risked their physical and mental health for the sovereignty of the country. Dean, C. (2000). Nam Vet : Making Peace with Your Past Wordsmith Publishing. Fernando, N., Jayatunge, R.M. (2010). Combat Related PTSD among the Sri Lankan Army Servicemen. Klaric M, Klarić B, Stevanović A, Grković J, Jonovska S. (2007). Psychological consequences of war trauma and postwar social stresses in women in Bosnia and Herzegovina. Rothberg JM, Rock NL, Del Jones F. (1984). Suicide in United States Army personnel, 1981–1982. Mil Med ;149(10):537-541. Somasundaram, D. (2007). Collective trauma in northern Sri Lanka: a qualitative psychosocial-ecological study International Journal of Mental Health Systems , 1:5. Unfortunately majority of the society can not understand this tragedy.